According to a Knicks PR maven, Spike Lee, longtime season-ticket holder and occasional director of the cinema, has been to "roughly half" of the Knicks games this year. That's probably not much less than he went to back in the Knicks' heyday — he does, after all, have movies to direct — but he's certainly a quieter, more mellow presence these days. It's often difficult to tell he's there. Last night, because we are a Professional Media Person, we saw the upcoming "30 for 30" documentary Reggie Miller vs. 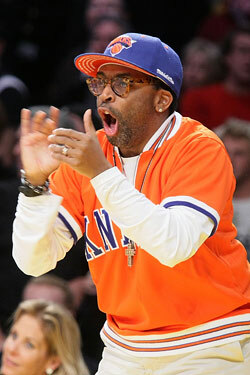 The New York Knicks, and it reminded us of something we'd forgotten: Spike Lee is freaking awesome. The film, which is playing at the Sundance Film Festival and debuts on ESPN the night of Selection Sunday, takes a look at the NBA playoffs from 1993–95 and those epic matchups between the Pat Riley Knicks and the Larry Brown Pacers. We learn about Reggie Miller, how his rivalry with his sister fueled his trash-talking competitiveness, about the battle for historical-basketball supremacy between Indiana and New York, about Patrick Ewing's tragic arc, about how Ahmad Rashad has a goatee now. It's a terrific film, but our takeaway was mostly: Man, we miss Spike Lee. The Spike Lee of the mid-nineties was at the top of his game, in his late thirties, fresh off Malcolm X, Crooklyn, and Clockers, a commercially viable, revolutionary filmmaker at the peak of his power and influence. This coincided with the best Knicks team since the seventies: Patrick Ewing, John Starks, Charles Smith, Charles Oakley, and Anthony Mason (who, since 1995, has become shockingly fat). Spike Lee was more than just the Knicks' courtside fan: He was the Knicks, and New York, a living, nattering manifestation of the city, screaming, hollering, making a spectacle out of himself in a way that was uniquely ours. Lee's most famous moment came in 1994, when he seems to have single-handedly inspired Miller to score 25 points in the fourth quarter of game five. Watch how Miller keeps barking at Lee after every basket. This led to the best part of the film, when Spike, now the centerpiece of the series (he was on the cover of every tabloid, essentially being blamed for Miller's outburst), travels to Indiana for game six, still sitting in the front row, a part of the game himself. Lee, ever the provocateur, points out that the Ku Klux Klan was born in Indiana, and says he'll be staying at the governor's mansion, in the "slaves quarters." Inside Market Square Arena, the crowd is charged in scary, clearly racially motivated frenzy, and it's all directed entirely at Spike. There's a brief moment, though he'd surely never admit it, where he looks a little scared. Then he's back out there again, screaming at Miller, high-fiving Starks, watching the Knicks win the game, and then the series. In present-day interviews, Lee is hilarious and wise, but you can tell there's a little part of him that isn't over it: There's a little part that relives those three series with the Pacers in his brain every day. Spike Lee is now 52 years old, slower, more deliberate, but you can tell he's itching to get back out there, to have a team to scream at and jump at and instigate, to be back in the game again. It has been (save the brief finals blip in 1999) that long since the Knicks were relevant, and Spike was a part of that national conversation. He's still making compelling films — we might be the only person who loved Miracle at St. Anna, but we did love it — but that part of Spike, the unofficial Knicks mascot and New York ambassador to the outside sports world, hasn't been around for more than a decade. (He was replaced by Rudy Giuliani as sports ambassador, a trade no one wanted to make.) The film was a reminder of how much we've missed him, and how desperately we need him, and the Knicks, to return to that place again.